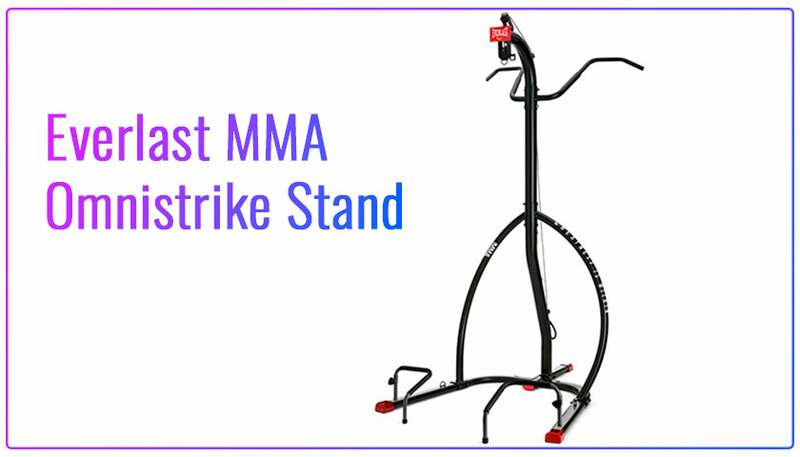 We present you Everlast MMA Omnistrike heavy bag stand Review. After the release of our General review of such fitness equipment, we got a lot of questions. Our readers asked questions about the specifics of MMA training and the most suitable equipment. So in this review we will consider the main characteristics and possibilities of using this rack. So, I begin. First of all, consider the characteristics by which users compare such equipment when choosing. Accommodate Heavy Bags up to 100 lbs. Everlast MMA Omnistrike Stand is specialized and allows for the possibility of training with punches, feet and knees. It has greater stability due to the features of its design. The legs of the rack are equipped with plastic nozzles so as not to damage the floor surface. The frame design is quite simple. You will not experience difficulties with the Assembly and placement of this equipment. The Assembly process takes an average of 1-2 hours. You can conveniently hang the heavy bag. For this purpose, there are two positions of the height of the pulley for fastening the bag. This is done in 3 steps – lock and lift. The frame of this equipment is made of a steel pipe with a strong powder coating. For greater stability, the rack provides the ability to use 3 weight plates for maximum stability. They are placed evenly and provide additional stabilization. After installing the equipment, you can use it for two types of training. Consider both options. 1. For strength training, removable handles for push-UPS are provided. They have foam coating for more comfortable use. With him feel more comfortable and more effectively fulfill push-UPS. These handles may have two positions. This allows you to change the position of the hands and perform two push-UPS. On the reverse side there is a horizontal bar. You can perform pull-UPS using one of several grip options. 2. Before practicing blows on a heavy bag, you can use three weight tiles for greater stability. Hang the bag. You can fix it not only on the top pulley, but also to engage the loop at the bottom of the frame. Depending on the bag you use, you can apply all types of blows. It can be all kinds of punches, elbow, knee or foot. It is worth noting that the shape and size of the equipment are convenient to use. It will be convenient for you to approach the bag and carry out the practice of blows. If you want to perform MMA training at home then Everlast MMA Omnistrike Heavy Bag Stand is one of the best equipment for this purpose. Good quality and affordable price make it a really profitable purchase. Optimal purchase with the recommended bag of this brand. Hey. I’m just looking at the MMA Heavy Bag Stand. Thank you for this review. Does it come with a bag? And how to find out the price of this equipment? Hi. You can buy a rack separately or together with a heavy bag. It is only necessary to take into account the maximum possible weight of the bag.